For private direct sales, a generous royalty will be donated to The Royal British Legion. 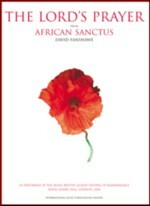 Produced by David Fanshawe and incorporating important revisions made to the score, this most recent definitive recording of African Sanctus concludes with his latest composition dedicated to world peace - Dona Nobis Pacem. A full cast of international artists representing Europe, Africa and America unites on the concert platform with soprano Wilhelmenia Fernandez, the Bournemouth Symphony Chorus and Choristers of St George's Chapel, Windsor Castle. Recorded 1994. 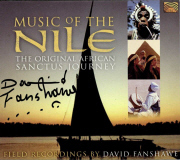 Music of the Nile is the companion source album to African Sanctus. 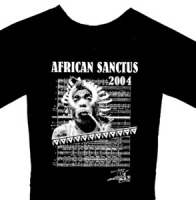 This album contains the pure, original African field recordings on their own, without the composed settings of the Latin Mass. Features some of the glorious ethnic music of Egypt, Sudan, Uganda and Kenya, recorded between 1969-75. 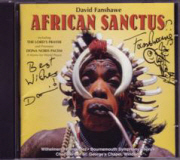 Some of the most energetic and exciting recordings of African traditions including full versions of all the original ethnic music used in African Sanctus, from Uganda, Egypt, Sudan and Kenya. Bwala Dance, Call to Prayer, Cattle boy's song, Dingy Dingy dance, Song of lamentation, Ritual burial dance plus many more important African recordings both musical and environmental, of the authentic sounds of the great waterway - the river Nile. Available to licence. Please enquire music@fanshawe.com.